[Since the Jewish leaders were plotting his death,] Jesus stopped his public ministry among the people and left Jerusalem. 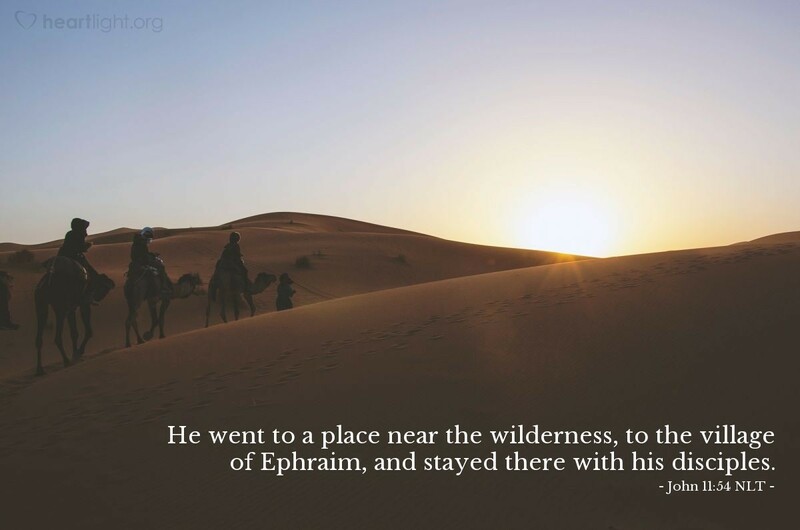 He went to a place near the wilderness, to the village of Ephraim, and stayed there with his disciples. In all four Gospels (Matthew, Mark, Luke, John), we learn that the last part of Jesus' ministry is specifically focused on teaching and preparing his disciples for his return to the Father. Many in the crowd turn away, and the determination of his opponents to kill him is growing. Jesus recognizes that he has a short time to prepare his disciples for his departure and the responsibilities and ministries they will have in his absence. Despite Jesus' example, many of us fail to share our vision and our ministries with others who can help us take advantage of the opportunities that God is giving us now and who can carry them on after we are gone. Let's learn from Jesus' example of the vital importance of sharing our visions, dreams, and ministries with others while we still have time. Father of grace and mercy, thank you for giving me the abilities that I have and the opportunities to use them for your glory and for the work of your Kingdom. Open my eyes, dear Father, to those around me with whom I can share the passion, understanding, and ministry opportunities you have given me. In Jesus' name, I ask it. Amen.